Glentoran's Jonathan Smith celebrates scoring the winning extra time goal against Ballyclare Comrades. Young Jonathan Smith spared Glentoran’s blushes by plundering a last gasp winner against battling Ballyclare Comrades at Dixon Park. The tense County Antrim Shield first round tie appeared to be destined for a penalty shoot-out, when Smith popped up with a late party piece. His goal helped ease the agony on the managerless Glens. They were dumped out of the League Cup by lowly Annagh United earlier this season and appeared to be the candidates for another shock. Amazingly, it was the east Belfast team’s first victory since August 20, when they defeated Portadown. 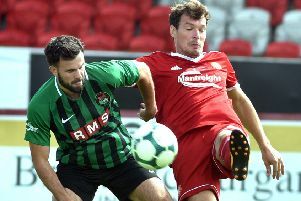 With Director of Fooball Roy Coyle again taking charge, Curtis Allen was recalled to the Glentoran attack -- he had recovered from a mouth abscess. However, it was young Smith, who came agonisingly close to opening the scoring on six minutes. He cut in from the left to send a low drive fizzing past the post, with Comrades teenage goalkeeper Ross McKnight struggling. The home team responded with Thomas Robinson, a summer signing from neighbours Larne, trying his luck from distance, his effort fizzing well over the top. Glentoran almost achieved the breakthrough on 19 minutes. McKnight got down brilliantly to push away a 25-yard Eric Foley free-kick and when the ball broke to Allen, the shot stopper again repelled the effort. McKnight was called into action minutes later when Foley powered in a low shot that the keeper did well to get a glove to. Comrades blew another sigh of relief on 37 minutes. This time Ross Redman’s free kick was hoofed past his own post by defender Gary Brown, who knew little about it. And, the Glens were cursing their luck once more as the clock ticked down to the break when Chris Lavery robbed the unfortunate Brown, but after a 25 yard dash - and only McKnight to beat - he blasted high and wide. The Glens again huffed and puffed after the interval, but failed to find a way through a resolute home defence, although they were only inches away from engineering a lead on 68 minutes when Gordon headed over at the back post following a Redman free kick. Ironically, it was the visitors missed the best chance of the 90 minutes when Chris Lavery robbed defender Gary Brown, but he held his head in frustration when his shot crashed against the inside of the post. Comrades could have nicked the lead in extra time, with Denver Taggart picking out Michael O’Hanlon, who dinked his shot just over. But the Glens at last had something to celebrate with that Smith strike on 105 minutes. Redman’s deep cross to back post wasn’t dealt with and the young striker pounced to head home. Unused subs: Irwin, Dillon, Crowe. Glentoran: Nelson, McAuley, Ferrin, Birney, Redman, Harmon, Foley (Caldwell 82), Gordon, Smith, Allen, Lavery (Leu 75). Unused subs: Morris, Delaney, Hamill.